← Day 1 June 25 – Let the running begin! I first woke up this morning at dawn to the sound of the prayer call from the nearby mosque. It was too early to get up, but the power was out, as it is typical over night, so the fan in my room didn’t work and the heat was stifling. I stayed in bed, but did not sleep anymore. At 6:00, my alarm sounded and I got up to get ready. When my bags were packed for the day, I sat down on the bed and waited. Sweat poured down my body and I was not yet moving. The team came by to pick me up and we first headed into the centre of Basse again to pick up water, our breakfast sandwiches and hot water for my coffee. Then we hit the road to drive back to the spot where I had left off yesterday. The sun was shining and there wasn’t a cloud in the sky. It was going to be a scorcher. The morning’s examination of the knee showed some swelling and a lot of bruising, but the cuts looked clean and had started to scab. All good! When we arrived at the starting point of today’s leg, I had already downed a 1.5 litre bottle of water. Next, we filled my hydration pack and the Gatorade bottles and the journey began. The road was bumpy and dusty. Every now and then, we were passed by a vehicle, belching black exhaust into the air and swirling up a cloud of dust. The first 10 k went by pretty uneventfully. At about the 10 kilometer mark, we reached a village. The guys had leaned on the horn to get the attention of the villagers and they all came to the side of the road, including lots of children. Kebba told the children that I was running for them and then said that whoever wanted to run to the edge of their village with me would be rewarded with a mint candy. Everyone was game and some of them, including a really small kid, dashed off in a mad sprint. The rest of us followed at a slower pace and Kebba got everyone chanting Welcome Andrea, Welcome Canada, Welcome Gambia in a rhythmic fashion as we ran. When we came to the sign at the end of the village we stopped and I got the candy out of the car. Instantly, all the kids crowded around me and eager hands were stretched out in my direction. Kebba told the kids to get in a line, so we could distribute the mints to everyone and wouldn’t miss the small children. Then to waves of good-bye, we carried on. We hadn’t brought any ice or cold water along today and my body temperature kept climbing. I thought I was drinking as much as the previous day, but when I stopped on the side of the road for what seemed like an urgent nature call, I couldn’t pee. Not a good sign! For the non-runners, you may wonder why I would talk about bodily functions, but the volume and colour of urine are an important indicator of hydration status. And without proper hydration, I will not be able to run day after day. I made an effort to drink even more and also stopped at the truck for Gatorade more frequently. I also reapplied sunscreen several times, as even the sports formula was no match for my sweat and the Gambian sun. Somewhere along the road we came to a police check. When the police man saw me running, he ran up to me and came with me for a couple of hundred meters. He thought I was crazy for wanting to run all the way to Banjul. My legs felt good, but the heat was definitely getting to me. It was over 35 degrees in the morning already and the mercury had likely kept climbing. We came past a few more villages and then Spider told me we were nearly at a school where they had alerted to the peer educators who deliver the Nova Scotia Gambia Association’s health education programs that we were coming through. I was having a hard time with the heat by now and stopped in the shade for a bit to try and cool down. Then, down the road, I saw the kids filtering out of the school – all of them wearing their white and blue school uniforms. More and more of the kids came out looking down the road where Pa Modou was honking madly. Kebba, Spider and I ran on to where the students were lining the road on both sides cheering loudly. I stopped once I reached the end of the line and shook the hand of the teacher. Then I walked over to the students and high fived and fist bumped them. They loved it and again I was surrounded by all of them eagerly stretching out their hands to shake mine. They all said thank you with great enthusiasm while I thanked them for their support. They were really amazing and gave me a big boost! These teenagers then also ran with me for a short stretch and only minutes after leaving them behind, waving and cheering, we reached Basse. Here we had a chance to buy a block of ice, which I desperately needed to cool my core temperature down. I sat in the shade next to some goats also enjoying the somewhat cooler spot. Pa ran some cold water over my body – what a great feeling! After a bit of rest, it was time to get the last 10 km done. A few steps after we got going, we came by Amenata’s Restaurant, our local hang out for our time in Basse. This is where we had lunch and dinner every night and where we had watched the soccer match. One of the ladies who works there had said she would run with me and when we came by, we called her out. She and Amenata appeared and low and behold, the woman had changed out of her African dress into a pair of shorts and a soccer jersey. Spider gave her his running shoes, as she was in flip flops, and off we went – through the bustling streets of Basse. The roads were crowded with donkey carts, goats, cyclists, pedestrians, cars and motorbikes. Shopkeepers were looking on as we came through or just went about their business. After a short run, the guys drove my running companion back to the restaurant and I carried on. Once I left the town of Basse behind, the dirt road ended and we hit pavement. This made running a bit easier, as the footing was better than the bumpy dirt road had been. I managed to pick up the tempo for a little bit, but the burst of energy only lasted a few kilometres. The paved road out of Basse first climbed a long hill and then turned into a few rollers. I had to stop and apply more ice a few times and the going got tough as the heat was really getting to me. Almado was going to run with me for a little today and we had more or less coerced him into joining me for the last 7 kilometers. He was a trooper and came with me for 3 km, but looking at him, I knew the heat was getting to him, too. What’s more, he wasn’t really dressed for running and hadn’t hydrated properly, so better to let him off the hook. At 19 miles, we reached another village and a few people were sitting by the side of the road. As we pulled in to stop, a man came out to hand me his cup of water. What a nice gesture of welcome! He then told me that his village was my home and we struck up a conversation. He turned out to be quite a character. 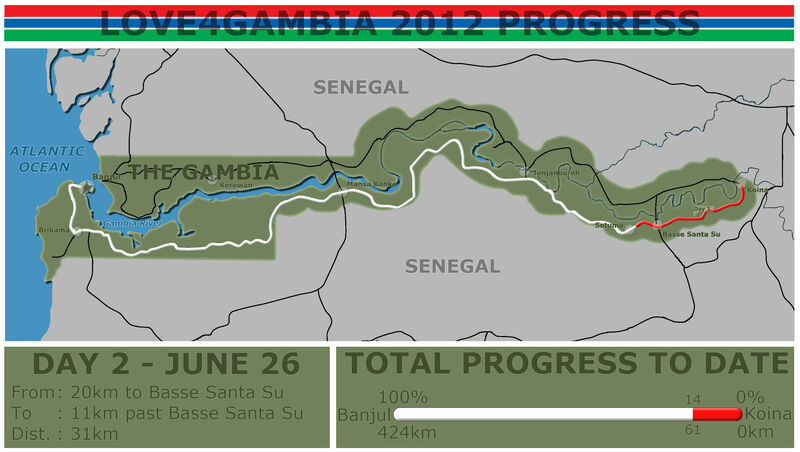 He had fled Guinea Bissau during a conflict and had walked for days to reach the Gambia. He told lots of stories as I laid down to relax and stretch a bit. He then went to get some peanuts and mangoes for us and gave those as a gift. Then, as we were driving off, he came by with a pot full of rice and meat and offered us to eat from it. We all had a few bites. A few school children were standing on the side of the road trying to hitch a ride to their school, so Pa stopped and they hopped in. I shared my Honey Stinger chews with them (all the mints had been given away), which they munched on happily. Back in Basse, we stopped at Amenata’s for lunch and then I came back to my room in the Gamtel House. The power was out, so I couldn’t check email or write, but I went about my chores, like doing my laundry by hand, rinsing the Gatorade bottles and packing up my suitcase for our departure tomorrow. It was hotter than hell in my room and when I finally got a chance to relax on the bed for a bit, I sweated just lying there. The power didn’t come back on until 7:30 tonight, just as we headed out for dinner. We had arranged to meet Janine and Casey, two Peace Corps volunteers, who I had met through Twitter and bumped into in Banjul, at the restaurant. We had a great evening sharing stories. The work they do here is really impressive and the two year commitment they make to helping others is admirable. Following our meal, we offered them a ride to the Peace Corps house. Just as we took off, the wind started to pick up, swirling dust around everywhere. Lightning criss crossed the sky and it was clear the rains were going to come! It hadn’t yet started in this part of the country, but as I am sitting here writing, it is pouring outside and there is a cool breeze! Here’s hoping tomorrow’s run will be a little cooler. It is already 10:30 now and we will be leaving at 6:00 am tomorrow. Definitely time for bed. Lots of love from the Gambia! This entry was posted in Charity Run and tagged Africa, children, children's health, children's rights, The Gambia. Bookmark the permalink. 10 Responses to Day 2 June 26 – How hot can it get? Hang in there Andrea, we are all pulling and hoping. Maybe even a little jealous, just a tiny bit. Proud though. Hmmm… scorching heat eh? ok then….. along with the energy we are sending your way…we’ll try to send some cooler weather… but we can’t make any promises ; ) ! What an inspiration, Andrea!!!! You are doing great! Much love and support from Nova Scotia!! My admiration for you Andrea, deepens with each passing day! Your joy for life, commitment and honour are truly remarkable! Lots of love. We are all inspired and cheering you on from Chelsea, Andrea!! My daughters and husband (and me!) are hooked to your posts, which I read aloud to them after dinner. We can’t wait to your next post! In addition to being a fantastic person and athlete, you are on gifted story-teller. Thank you for bringing us all into your adventure. Tons of luck!! xoFlorencia. I really wish I was running with you. I enjoy reading you blog at night. Lots of support from Zoe.